Heading: Identifies the business, the financial statement title, and the time period summarized by the statement. Minus signs are missing. Hardly ever do you see minus signs in front of expense amounts to indicate that they’re deductions. Sometimes, parentheses are put around a deduction to signal that it’s a negative number, but that’s the most you can expect to see. Your eye is drawn to the bottom line. The statement emphasizes the final profit by putting a double underline under it or placing it in bold type. Profit isn’t usually called profit. Bottom-line profit is often called net income. Businesses use other terms as well, such as net earnings or just earnings. You don’t get details about sales revenue. The sales revenue amount in an income statement is the combined total of all sales during the time period; you can’t tell how many different sales were made, how many different customers the company sold products to, or how the sales were distributed over that time. Gross margin matters. The cost of goods sold expense is what it cost the company to buy or create the products it sold to customers, the sales revenue of which is reported on the sales revenue line. You want to match up the sales revenue of goods sold with the cost of goods sold and show the gross margin (also called gross profit), which is the profit before other expenses are deducted. Operating costs are lumped together. This category consists of a wide variety of costs of operating the business and making sales, including labor costs, insurance premiums, advertising, and legal costs. Like with sales revenue, you don’t get much detail about operating expenses in a typical income statement. In addition to sales revenue from selling products and/or services, a business may have income from other sources. For instance, a business may have earnings from investments in marketable securities. 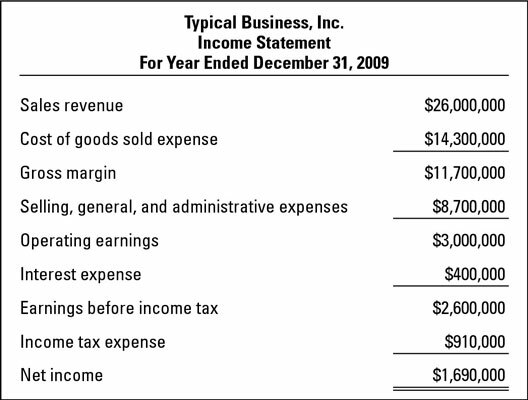 In its income statement, investment income goes on a separate line and isn’t commingled with sales revenue.